A family full of retching green faced, doubled over misery is just what we don’t want after a slap up xmas day meal, so here are my tips for cooking turkey. Turkey is just like poultry isn’t it? Basing an opinion on that, we know that we need to handle how to cook turkey carefully. Our single best friend when it comes to using Turkey has got to be our thermometers. If we add stuffing to the bird, it becomes even more essential. In the Scottish Mum house, we always use stuffing as it’s sort of a family tradition and we use regular stuffling with sausage meat. It makes the turkey more dense and does mean it will take longer to cook. To be perfectly safe, we should be cooking our stuffing separetely, but we just do it how my mother and grandmother before her cooked food. We don’t use frozen turkeys, but if you do, make sure they are completely defrosted. It is dangerous to cook a turkey that is still partly frozen. Treat turkey like chicken when you are preparing it. Keep surfaces scrupulously clean and do not use the same utensils for other purposes before a thorough cleaning. A pre-heated oven set at 325 degrees F is our favourite way to go. We baste our turkey with some fat and bacon, encase it in tin foil and put our turkey breast side down to begin cooking. Foil can add to the cooking time but we like to keep our turkey quite pale until the last half hour of cooking. A tinfoil covering isn’t necessary, but it can help you choose the end colour of your bird at the table. I’ll say it again, use your thermometer. About half an hour before the end of cooking time, we remove our turkey, turn it the right way up and leave the foil open at the top to brown it the way we prefer it. We also take the juices off at this point to make the gravy for our meal. The internal temperature of a cooked turkey should be 165 degrees F. It’s important to make sure the stuffing is also at this temperature. While the legs or wings, or even the breast at the thickest part of the turkey have have reached 165, the stuffing might not have. It means a little bit of extra care when you take the temperature of your bird and check the cavity with the stuffing as well as the thickest part of the bird. 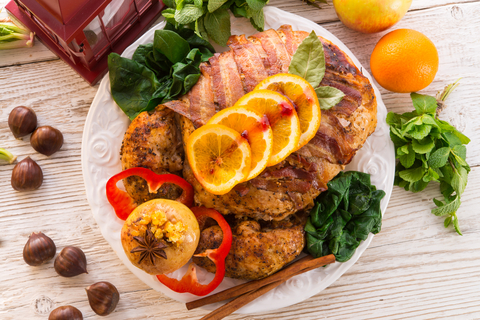 If the stuffing doesn’t reach 165 degrees, there may still be bacteria that could be harmful to the eater. I’d never buy a turkey that has been frozen and contains stuffing. I know there would be cooking rules, but I’d not feel comfortable unless I know exactly the weight of the turkey without stuffing and the weight with it. If you have to use stuffing in the bird and not cook it separately, try to follow these guidelines to keep you safe. Do not keep stuffing sitting around for days on end. If you make fresh, use it as soon as you can. Check the instructions on the pack of ingredients for the manufacturers recommendations. If you do pre-prepare, store the mix in the fridge. Stuffing should be moist and not bone dry. In Scotland, we’d call the dry stuffing skirlie and it has a completely different texture to the stuffing we use in a turkey. Don’t pack the cavity tightly with stuffing as it needs room for the heat to permeate and it works better with moist stuffing. Don’t cook stuffing in a turkey if you plan to fry, grill or microwave it. It’s a roast turkey deal only. Can I shout this loud enough….. I’ll presume anyone reading this for guidance has bought their turkey from a retailer. If someone has the skill, knowledge and availability of killing a turkey to cook, they’re going to know the rules to cook by. DO NOT REMOVE stuffing from a turkey in the oven until it has reached the 165 degrees F temperature. We rest our turkey for about 20 minutes, with tin foil covering it before we carve and remove the stuffing. It adds to and improves the flavour. Don’t leave more than 2 hours between cooking and putting the leftovers in the fridge. We use our turkey for up to 2 days after it has been cooked. There is never any left after that, but if you have excess, you could leave it 3 or 4 days, though I’d not be comfortable personally at the 4 days afterwards. There is also the option to freeze, but remember, that reheated leftovers also need to be cooked to the 165 degrees to make sure any bacteria are obliterated.